Guardian Angels- are they really there? I believe so, without a shadow of a doubt. 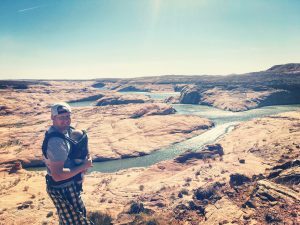 In October of last year we took Indy on her first trip to Lake Powell. Lake Powell is our special place because it is where our story began, on July 7, 2004. B and I met on the boat dock of Lake Powell, fell in love (or something like it) in a week’s time, and have been back every year since. 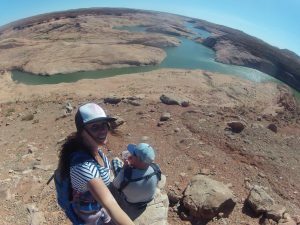 Lake Powell is our favorite place for relaxing, hammocking, hiking, boating, and exploring. For years we talked about our love for this place and our desire to share it with our future children. 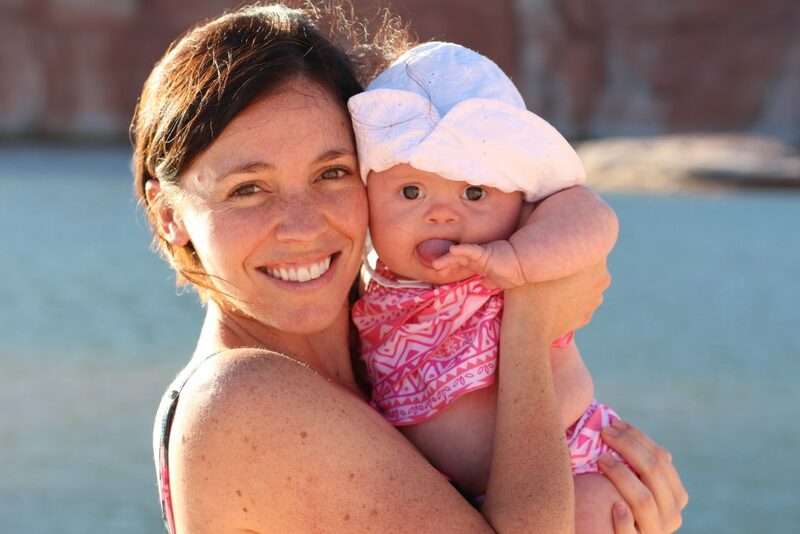 Our first trip to Lake Powell with our baby girl was a long awaited, much anticipated experience. B & I were so excited to share our favorite place with Indy and start making a life-time of memories with her. 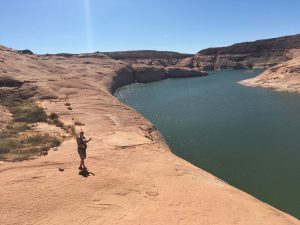 No trip to Lake Powell is complete without a good hike- the red rock cliffs and canyons are just breathtaking. We strapped Indy Llew in her carrier and set off on our morning adventure. We hiked a couple of miles, to the top of a mountain overlooking our winding finger of the lake. We admired the view for a windy moment then started our trek back. B was carrying Indy and was in front of me. We were walking along the ridge of the rounded cliff, a very safe distance from the edge and on sturdy ground. Suddenly- the red rock stone beneath B’s feet broke. Within a split second he and Indy were sliding down the side of the cliff. It was a rounded cliff edge with nothing for B to grab on to, and about a 50 foot drop into cold water. I screamed, “Please God, no!” as I ran towards them, but there was nothing I could have done besides jump in after them. Then in what seemed like a blink of an eye, B and Indy were up on steady ground. There was no way to explain it. With nothing to grab onto, no way to stop the fall, and no visible way to pull himself back up, the only explanation is that B had help. It was as if someone grabbed him and pulled them up to safety in a matter of seconds. It all happened so fast, yet the scene replays in slow motion in my mind. We were not alone in that moment. Our Guardian Angels were present, and they saved us from what could have been a devastating ending. I clung to B and Indy like my life depended on it. I was trembling so hard I could no longer stand, so we sat, and offered a prayer of thanks. We thanked our Father in Heaven for protecting us and giving us Angels. We thanked our Angels for being present and aware of us, and stepping in to help when we were in desperate need. I was overwhelmed with emotion and gratitude that B and Indy were safe and in my arms. This experience was profound. However it was not our first. Our little family, and me personally, have been lifted and protected by Angels several noticeable times over the past few years. 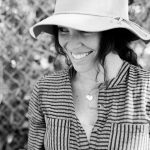 I have experienced moments of saving, comforting, encouraging, and protecting. I have felt their presence and their love. I know they are near and they are given to us individually for different purposes. They love us, and they are here to help us in our time of need. What an absolute gift. This was amazing! I LOVE reading things that make me feel the spirit! Indy alone was an angel sent here to this earth to love and admire! You guys are an amazing family with many blessings in your future! 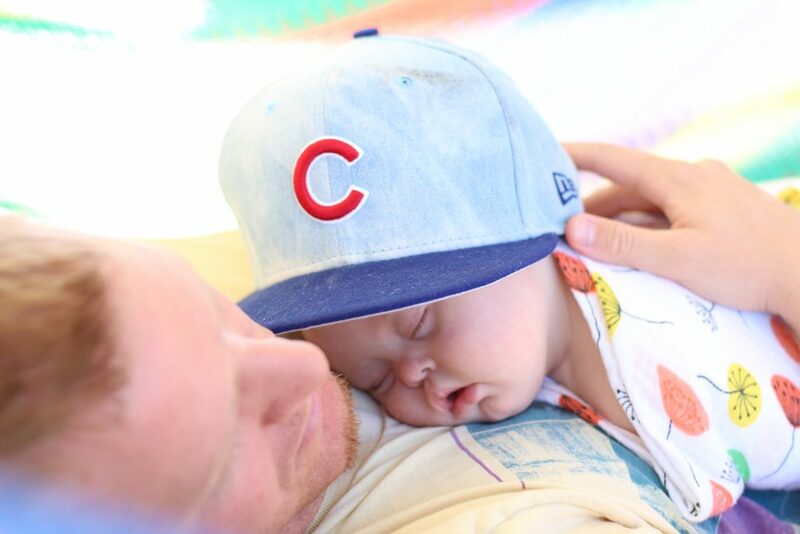 We LOVE Lake Powell! I’m glad you guys made it home safe! Please stop almost dying and having your family almost die. Thank you.